Most of the area’s still-open farmers markets will soon say goodbye until spring, but at least they’re going out in festive style. East Atlanta Village, East Point, and Peachtree Road markets, among others, are turning their final gatherings into holiday affairs. In addition to their usual vendors, they’ve invited local artisans to sell holiday gifts and crafts. If you hate holiday shopping, stop at one of these special markets first. They offer an opportunity to find unique gifts, pick up a wreath or Christmas tree, and stock up on locally grown ingredients and specialty foods for holiday entertaining, all in a relaxed, celebratory atmosphere. Think of them as the anti-mall shopping experience. East Atlanta Village Farmers Market, 4 p.m. to 8 p.m., 561 Flat Shoals Avenue: In addition to the fresh produce, baked goods, meats and cheeses available weekly, this holiday market will also offer jewelry, clothing, crafts, teas, and Christmas teas and wreaths. This market will be held across the street from its usual location, behind Midway Pub. Tucker Farmers Market, 4 p.m. to 8 p.m., 2333 Main Street: More than 25 local farmers and food producers will be joined by artisans selling handcrafted products suitable for gift-giving and holiday decorating. Green Market at Piedmont Park, 9 a.m. to 1 p.m., 12th Street entrance off Piedmont: Shoppers can pick up fresh local food AND a Christmas tree at the park’s final market of the season. Peachtree Road Farmers Market, 9 a.m. to 12 p.m., 2744 Peachtree Road NW, Atlanta: A wide range of artists—and Christmas carolers, too—will join the weekly vendors inside the Cathedral of St. Philip for this very popular end-of-season holiday market. Farmers Market at Sweet Apple Village, 1 p.m. to 5 p.m., 12030 Etris Road, Roswell: Even though this market operates year-round on Thursdays, this special-occasion market is moving to Sunday to accommodate the busy schedule of Santa Claus, who will stop by to pose for photos. Santa’s elves will be on hand to help young shoppers select gifts for nearby parents, who will also enjoy the selection of locally made gifts and gourmet food items. 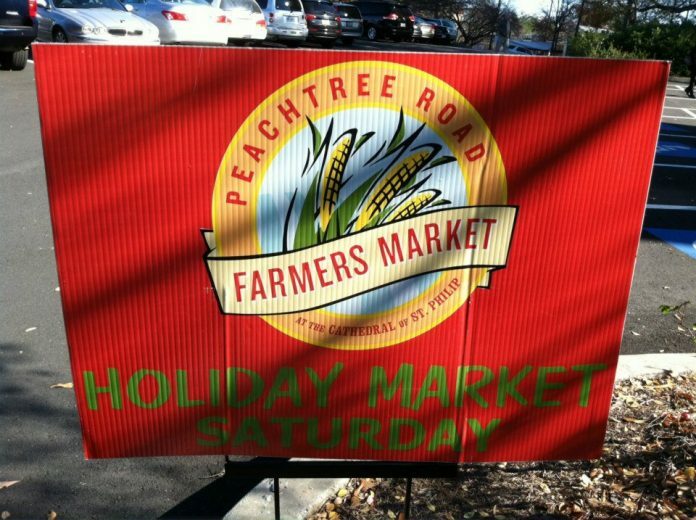 East Atlanta Village Farmers Market, 4 p.m. to 8 p.m., 561 Flat Shoals Avenue: The market ends its 2013 season with a repeat of last week’s holiday sale. East Point Farmers Market, 9 a.m. to 12 p.m., 2757 East Point Street: This monthly market ends its season with an expanded gathering of vendors. In addition to fresh produce and specialty foods, you’ll find handmade arts and crafts for gift-giving. Even after these markets are gone, you’ll still be able to shop at the area’s year-round farmers markets, including Decatur, Marietta Square, Morningside, Sweet Apple Village, and Truly Living Well.